• Visit our Singapore Store to Experience this wonder of this wireless product. frequency as compared to current revolution series. having to adjust the audio level on the microphone. There is no doubt in the fact that Sennheiser has made an irrefutable mark in the audio industry. Also the owner of Neumann, these manufacturers have countlessly proven they can be relied upon where perfection is required. In their recent release, they have made it even clearer that their products are above reproach. Have you met Sennheiser AVX-MKE2 yet? Well, it is the next big thing in town. From the outlook, you will fall in love with the design, but that is not all. There is so much more to admire about this fabulous machine. Where filming is involved, precision is necessary. This digital wireless microphone system understands this perfectly well. The system exhibits easy configuration. Ideally, you can set out filming in a couple of seconds. The ultra-compact receiver it comes with supports direct interaction with the audio input of most recording devices. What makes some audio systems unattractive is the fact that they are quite challenging setting and using. Well, Sennheiser AVX-MKE2 saves you that stress. There is not many configurations involved so you can use it without having to be an expert. Yet again, someone does not have to understand audio engineering or RF to be able to make the most out of this AVX audio system. Yet another thing you will not fail to like about this system is the form factor. Its uniqueness makes it perfectly suited for cameras. One aspect that nearly everyone gets to notice is the rotating mechanism of the receiver&apos;s XLR. It is scenic and on top of that enables easy to reposition. Ideally, someone will be forgiven for thinking that the receiver is part of the camera body. The soft notches available on the receiver keep the rotation going. In some cases, it is true that directly plugging the receiver might not work. Under such circumstances, you can take advantage of an XLR cable to facilitate the connection. In most cases, however, you will have the receiver compatible with the other devices including audio field bags and camera. When it comes to filming or professional audio interactions, only the best is required. 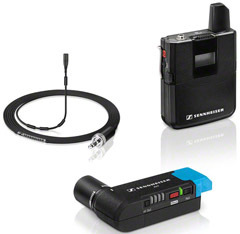 Sennheiser AVX-MKE2 guarantees the unmatchable quality of digital audio transmission. The system boasts of a latency of 19 ms. For people well versed with video terms, it is appropriate to say that it is less than one frame, by far. What this promise is that both the audio and video will be in harmony. Both the audio quality and transmission quality guaranteed by this system is top notch. That makes it a reliable companion for filming major events or audio recording sensitive interviews. Where filming is involved, reliability is key. No one wants to have the experience of failed batteries when in the middle of a serious shooting project. AVX transmitter has a battery life of at least 10 hours with the receiver being able to last for five hours minimum after a full charge. The RF adaptive power switching capabilities of Sennheiser AVX-MKE2 makes the experience even better. The system has the unique ability to detect phantom power. It will, therefore, turn off the moment the camera is switched off. The Sennheiser AVX-MKE2 comes handy when used alongside several devices. It perfectly fits the input sensitivity of your camera without the need to adjust the audio level present in the microphone. Are you worried about the audio system of an upcoming wedding? Well, your search stops at Sennheiser AVX-MKE2. This system is also ideal for filming documentaries, undertaking corporate videos and even carrying out street interviews. This AVX takes care of your audio worries, leaving you to concentrate on other essentials. When you purchase Sennheiser AVX-MKE2 set, there is so much in store for you. In the box, you will find the plug on receiver, body pack transmitter alongside lavalier microphone. Together with the package are all the necessary accessories you will require when operating the system with DSLR cameras and camcorders. The self-figuring digital transmission system it comes with makes the setup process a lot easier. In the past, Sennheiser has demonstrated its ability to produce quality microphones and audio systems. In yet another release, this company has let it out to the entire world. For a price under US $1000, this system comes at a good bargain. From what it promises, you can sit back, relax and enjoy the experience where audio recording is involved. Someone can positively say it is worth spending your precious cash on. The AVX-ME2, is just plugged and play without having to tune or adjust any freqency, thanks to Sennheiser digital audio technology. Recalled those days using the UHF, I have to pair and then set the frequency that with littlie or no interference. The new AVX is just hassle free. Do it now! Sennheiser is offering this fabulous trade-in program from October 1, 2016 to December 31, 2016. It's a great way of not only saving some money for your old wireless inventory, but it allows you to grab a genuine bargain - especially useful at this time of year. Whether you're a small business needing to purchase useful items with the tight budget or a school/government organization who'd like to optimize the 'use-it-or-lose' nature of funding and budgets, end of the year is most certainly the right time to act.